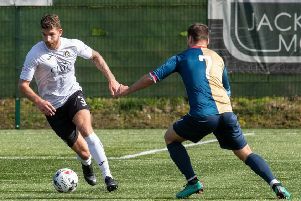 Edinburgh City boss James McDonaugh admitted he and his players are now fully focused on the play-offs after a 2-1 defeat by Clyde at Ainslie Park. Their Ladbrokes League Two title aspirations are all but over with leaders Peterhead seven points clear and with just three games remainnig to play. The loss – the club’s third in their past five matches – also dropped them to third in the table, three points adrift of Saturday’s opponents. Blair Henderson’s 37th goal of the season from the penalty spot had edged the hosts in front 60 seconds into the second half but two goals in the closing ten minutes from substitutes Ally Love and Kristoffer Syvertsen won it for the Bully Wee. And although thrilled just to be in a position to challenge for promotion at this late stage in the season, McDonaugh revealed he had a few choice words for his players in the dressing-room afterwards. “I went absolutely mental at them to start with because when you’re 1-0 up and you get beat 2-1 then it’s not acceptable. But the message I left them with is that you’ve got to have the right mentality going forward,” he said. “We would have loved to have been higher but I’ve never expected it. For me it’s always been just to go out and play with no fear but that’s easy for me to say standing at the side of the pitch. We’re punching well above our weight and we have been all season. On the match itself, McDonaugh added: “I thought we started the second half really well. We were on the front foot but probably always needed that second goal to make sure. I think we dropped off the game where I tried to change it but Clyde are a good side. After a fairly scrappy first half, the game burst into life when former Hibs man Danny Galbraith went down under the challenge of Barry Cuddihy 30 seconds after the restart. Clyde manager Danny Lennon was thrilled with the application of his players and their never-say-die attitude. “They’re a special group. They’ve shown umpteen times this season a real will to come back in games after going behind,” he said. “There are twists and turns every week and that’s what makes it a fantastic league. Edinburgh City: Antell, Thomson, McIntyre, Black, Balatoni, Walker (Rodger 90), B Henderson, Shepherd, L Henderson, Breen (Watson 58), Galbraith (Taylor 85). Subs: Morton, Donaldson, Lumsden, Diver. Clyde: Currie, Cuddihy, McNiff, Lang, Rumsby, Grant (Syvertsen 67), Banks, McStay (Love 67), Goodwillie, Rankin, Lamont (Boyle 85). Subs: Nicoll, Lyon, Coghill, Hughes.